Home » Latest News » Happy Easter! About 40% of the world’s chocolate is made from cocoa beans picked in West Africa, where many children, are trapped in slavery and forced to work. Recent years have seen several well-known chocolate manufacturers, including Cadbury and Nestle, produce FAIRTRADE chocolate. By buying cocoa beans from certified FAIRTRADE, Rainforest Alliance or UTZ Certified, these chocolate producers ensure there is no forced labour or trafficked labour on cocoa plantations. 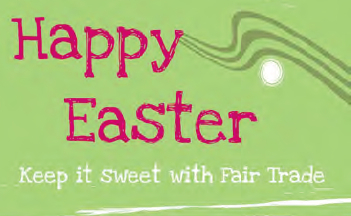 Encourage others to make the ‘switch’ to FAIRTRADE. If you live in an area where no FAIRTRADE, Rainforest Alliance or UTZ certified chocolate is available, use your buying power to make a change. Ask your local shops to stock ethically produced chocolate.